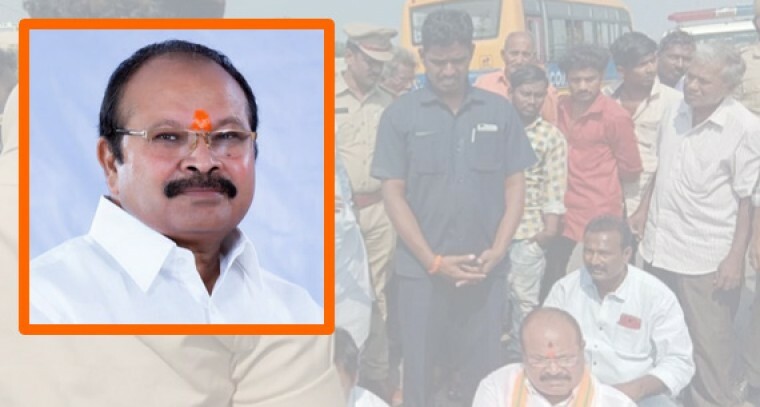 Guntur: Police officials stopped BJP state president Kanna Lakshminarayana and MP GVL Narasimha Rao along with the activists at Manipal Hospital near Kanakadurga Varadhi in Tadepalli town on Thursday while they were proceeding to Tadapalligudem to extend support BJP MLA P.Manikyala Rao's protest. When the police stopped the BJP leaders, Kanna Lakshminarayana, GVL Narasimha Rao sat on the NH-5 raised slogans against the TDP government. for stopping them. They said that the TDP government is taking revenge on the opposition parties and diluting their protests. Kanna Lakshminarayana warned that they voters will teach a lesson to the TDP in the coming election. Later, BJP activists raised slogans against the TDP government. Police shifted Kanna Lakshminarayana and GVL Narasimha Rao to Kanna's residence at Kannavarithota in Guntur city.